What is wrong with this president, who owes his election to young people and was supposed to bring a tolerant, more inclusive vision — but insists on blaming and berating the young at every turn, facts be damned? Figures 1 through 4 show the real-life trends in drug abuse, crime, and imprisonment and just how mind-bogglingly backwards the president’s notions of drugs and crime are. In fact, crimes of the type that generate imprisonment (drug offenses, and Part I property and violent felonies) have plummeted among teenagers and skyrocketed among middle-agers over the past 20 years, with trends in imprisonment following accordingly. The president’s proposed reforms contain many valuable ideas, all of which will be misdirected by the prevailing misconceptions of modern crime, which remain utterly baffling. Why is this otherwise smart and savvy president (like so many in authority) blind to reality when it comes to young people? Why does he remain hopelessly mired in the 1990s and before? Do his advisors read FBI, Bureau of Justice Statistics, Centers for Disease Control, and similarly definitive agencies’ reports on the revolutionary changes in the structure of crime and imprisonment in recent decades? Here’s a sample: From 1996 to 2013, the numbers of teenagers and young adults under age 25 in state or federal prison fell by 9,000. 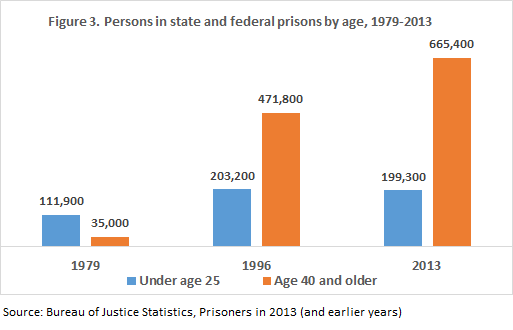 Meanwhile, the numbers ages 40 and older in prison skyrocketed by 394,000. That is, it is older people who are now filling prisons. Didn’t the president see the reality that there are now three times more middle-agers than teenagers and young adults in prison? How did this happen? The trends are straightforward. During that period, the numbers of Americans under age 25 arrested for drug and Part I criminal offenses fell by nearly 800,000, while arrests of Americans ages 40 and older for these offenses rose by 850,000. These are the ages of parents raising teenagers. Why has crime and imprisonment among middle-agers risen over the last 35 years? Largely due to surging drug abuse (Figure 4). In 1975, a little over 2,000 Americans age 40 to 64 died from abusing illegal drugs (the tip of the addiction iceberg). In 1995, 5,000. In 2013, more than 24,000. Meanwhile, the numbers of teenagers and young adults under age 25 dying from illegal drugs also rose, but to much lower levels. Again, these are clear, easily accessible trends — but they require official admission that the War on Drugs has been a disaster. 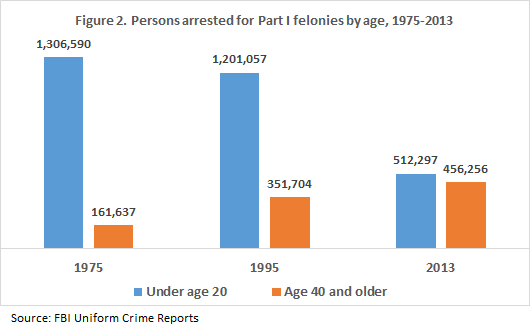 Here’s another way to look at the trends: In 1975, 17 times more youths than over-40 middle-agers were arrested for drugs, and 8 times more teenagers than middle-agers were arrested for Part I felonies. 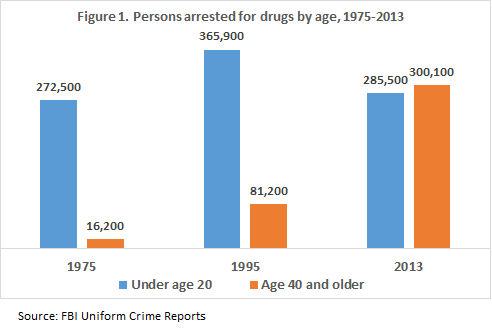 In 2013, more 40-agers than youths were arrested for drugs, and nearly as many were arrested for Part I offenses. The trends are striking and obvious: Plummeting arrests among the young. Skyrocketing drug abuse, arrests, and imprisonments among the middle-aged. That’s the new structure of crime. We need a president for today, not 1975. It’s bizarre that the president’s rhetoric is seen as being somehow sympathetic or pro-youth. Imagine if he had justified his reform proposals with the statement: “What is not new is black people doing stupid things…” Put in any other group in society into his sentence, and it becomes hate speech. True, most middle-agers with drug and crime problems probably started during teen or young adult years. But the reverse is also true: most teenagers with drug and crime problems are surrounded by adults, including their parents, with similar problems. 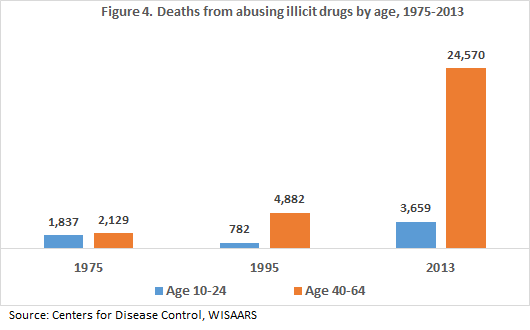 Note that the increase in drug abuse by middle-agers in the 1980s and beyond preceded the increase in drug abuse by young people in the 2000s, indicating these problems filter down from older to younger ages. Doesn’t the commander in chief comprehend the implications for children, families, and communities of rising elder addiction and crime?